As transcribed by one of Ludwig Wittgenstein’s students (and then set to type by a publisher) from the philosopher’s lectures at the University of Cambridge: Wittgenstein went on to say, famously, “what we cannot speak about, we must pass over in silence.” In other words, when words fail we might want to use emojis. Wittgenstein managed to say quite a lot about the topic. More often these days, I’m managing to resist the urge to tag my email and text messages with an emoji. The sentiment can seem too flat, too unambiguous for my meaning. True, I haven’t dived in to the expanded library of figures available now on smartphones, but could there be something valuable in letting the receiver grapple with the emotional meaning hidden in my words? 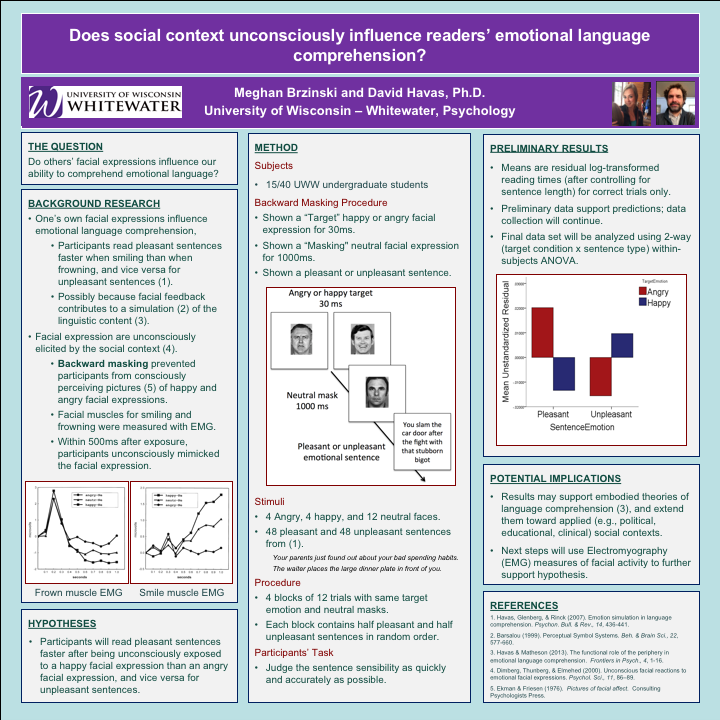 Recent developments in understanding the relation between language and emotion suggest that text conveys emotional content without directly referring to emotions, without relying on prosody, and (most likely) without relying on prior association of emotion with the particular linguistic patterns. If readers have an ability to construct, or re-construct, emotional messages from sparse chunks of text, why not let them? After all, great literary works manage to engage empathy and inspire “Likes” (in the form of books sales) without smiley faces. So, are emojis impish enablers, causing us to sell ourselves short as emotional communicators? Or do they facilitate emotional connection by co-mingling seamlessly with our words? 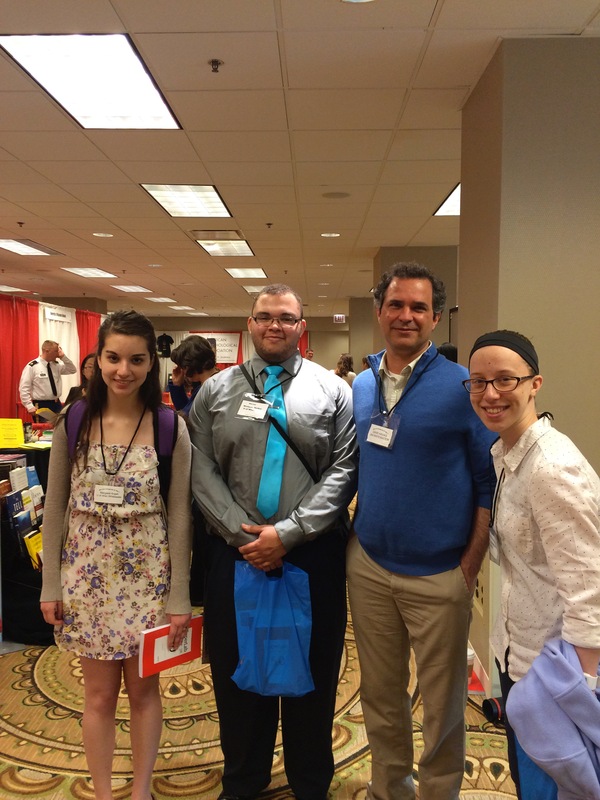 First impressions are heavily influenced by emotional expressions such as smiles. 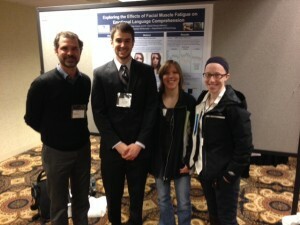 In face-to-face contact, smiling individuals are perceived as warmer and as more competent than nonsmiling individuals. In computer-mediated communication, which is primarily text-based, the “smiley” (☺) constitutes the digital representation of a smile. But is a smiley a suitable replacement for a smile? We conducted three experiments to examine the impact of smiley use on virtual first impressions in work-related contexts. Our findings provide first-time evidence that, contrary to actual smiles, smileys do not increase perceptions of warmth and actually decrease perceptions of competence. Perceptions of low competence in turn undermined information sharing. The adverse effects of smiley use are moderated by the formality of the social context and mediated by perceptions of message appropriateness. These results indicate that a smiley is not a smile. 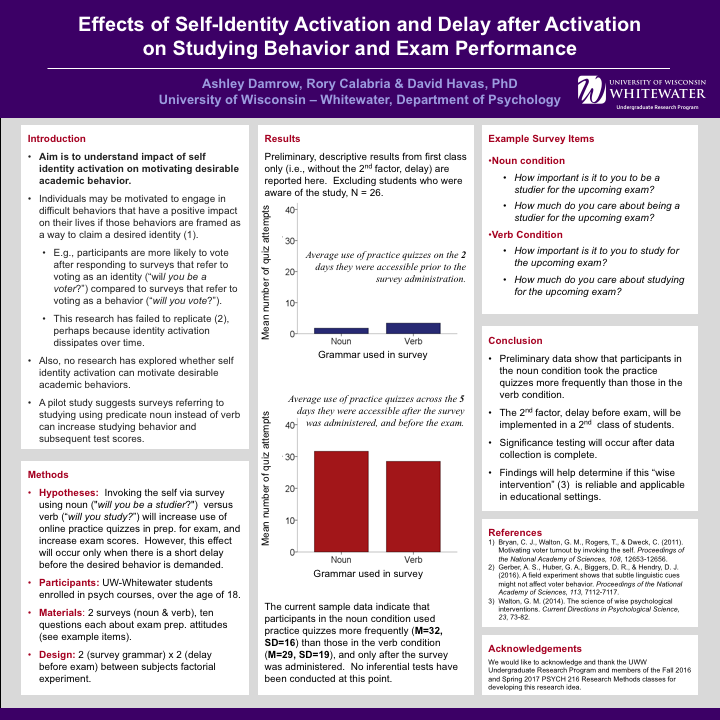 The findings have implications for theorizing on the social functionality of virtual emotional expressions. An emerging spring tradition is for undergraduate lab members to migrate to Chicago for the annual meeting of the Midwestern Psychological Association (and to other locales) and present their research. We’re lucky to have some great lab science ambassadors. 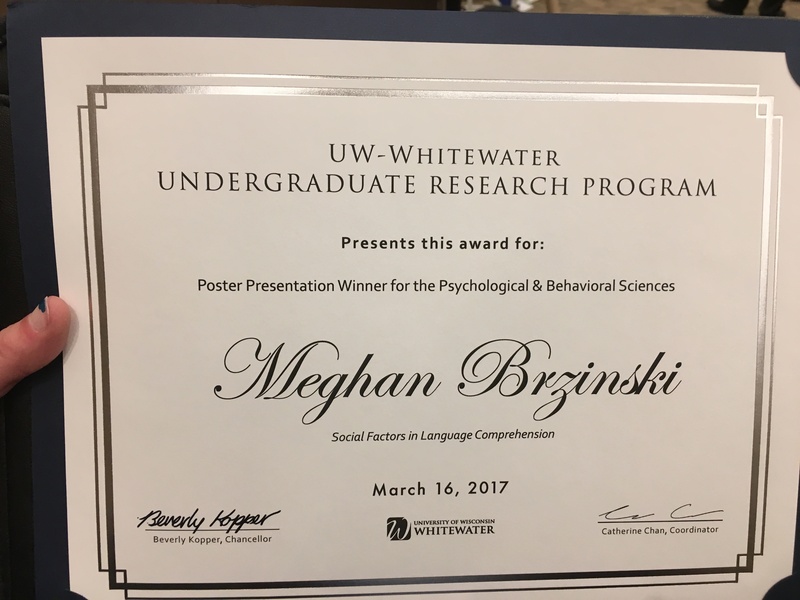 Congratulations to lab member Meghan Brzinski who won first place in the social sciences at the 2017 Undergraduate Research Day presentations! 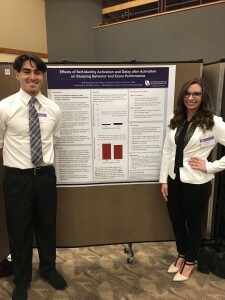 In fact, lab research was in full bloom at this year’s campus Undergraduate Research Day, with additional posters from lab members Sephora Wawa, Ericka Schaeffer, and Rory Calabria and Ashley Damrow (pictured). here’s to your future successes. Cheers! 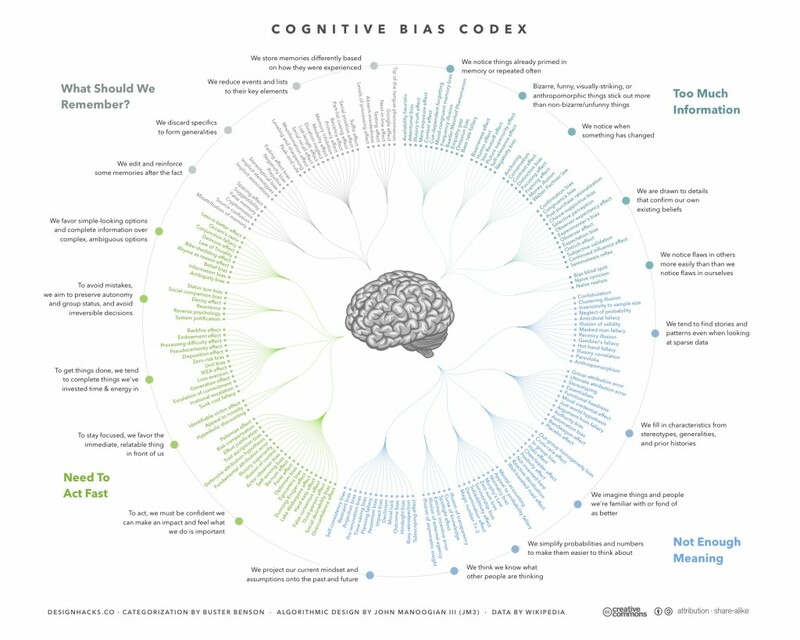 Why are cognitive biases so ubiquitous? In a word, Bandwidth. This beautiful graphic illustrates the bewildering array of psychological biases that have been documented in the literature. I must admit that I was surprised to see how numerous they are. But most fascinating to me is the broader categorization of biases according to the “problem” that they solve. It’s intriguing to think that despite the apparent heterogeneity in the errors we commit, there may be some common explanations that may help us to understand their causes and, perhaps, ways to diminish their adverse effects. Two of these “problems” are familiar to me, since I teach about them in my cognitive psychology course. What are called, “too much information” and “not enough meaning” in the graphic, I call “too much input to include in perception” and “not enough input to explain perception” in my lectures. But both of these are related to a single, simple idea that has been observed repeatedly by neuroscientists over decades (including Vernon Mountcastle, Marcus Raichle, Charles Anderson & David Van Essen to name just a few). 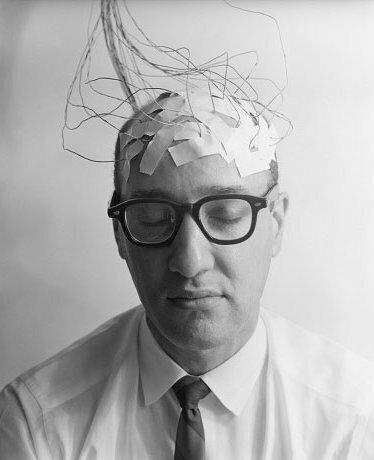 Raichle has pointed out that the brain compresses the unlimited amount of information present in the perceivable world into a much, much smaller amount of information – e.g., roughly just one-millionth of the available input is conveyed to the primary visual cortex, and even less is available to attention and conscious awareness! Such severe data compression is probably related to the remarkable energetic efficiency of the brain, an organ that consumes roughly 15 watts of power a day – less than it takes to power a light bulb. And yet, those 15 watts represent 20% of the body’s total energy budget, despite the brain comprising only 2% of the body’s total weight. Thus, the brain is constantly active, probably working to overcome its inherent bandwidth limitations in clever, but flawed ways. An article in the New York Times that examined how close we are to achieving artificial intelligence elicited three letters to the editor, one of them from my Ph.D. dissertation advisor Art Glenberg (along with his colleague Dennis Proffit). He argues from the perspective of research in “embodied cognition” that AI is impossible without an accompanying body, and cites my dissertation research as one demonstration of that requirement. How will the evidence from embodied cognition influence efforts to achieve AI? 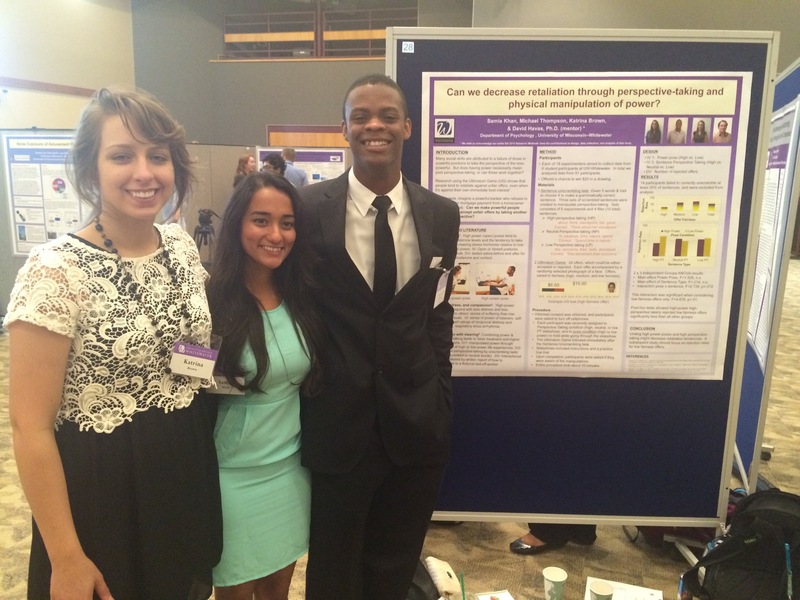 Will it hinder them, or can embodied cognition research help to advance those efforts? Such questions are pondered by students in the UWW Transhumanist Association. The letters to the editor can be found here. 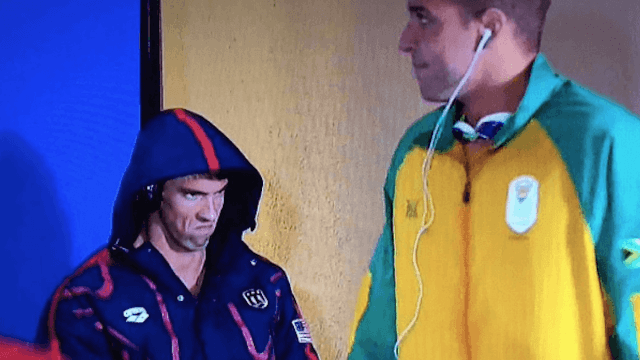 Dr. Havas was interviewed for a story in Outside Magazine Online about this viral image from the 2016 Olympics. Newly published research from the lab aims to understand how politicians use language to engage the emotions of mass audiences. The study was based on work we’ve done to illuminate the relationship between human emotions and language processing, a relationship that has only recently gained attention in the field of cognitive science. 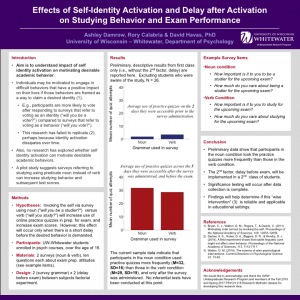 The full article can be downloaded at the open-access journal Frontiers in Psychology website. We know that presidential candidates carefully tailor their language to influence the electorate during the campaign season. But little is known about how, at the cognitive level, presidential speeches stir the emotions of voters. The new study, conducted in collaboration with political science professor Dr. Christopher Chapp of St. Olaf College, looked at stump speeches from then-candidates Barack Obama and Mitt Romney in the 2012 U.S. presidential election to identify the type of sentences that appeared in these evocative speeches more often when compared to more ceremonious State of the Union addresses. Those sentences were then evaluated for what, exactly, enabled them to pack an emotional punch. We found that stump speeches, meant to engage the passions of listeners, contain many more instances of past tense verbs with the “-ing” ending, indicating an ongoing action, in contrast to State of the Union addresses that are intended to justify a policy agenda. 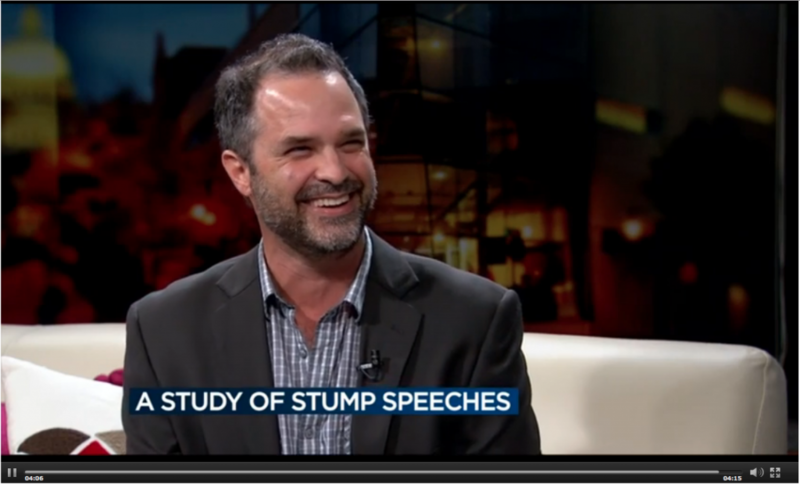 This isn’t because stump speeches contain more past tense verbs in general – they don’t. Instead, the study authors suggest that the “-ing” ending is more effective at tapping audience emotions, which is why politicians are using it (consciously or not) to rally their bases. For example, the past-tense phrase “the folks here held signs” implies action happened in the past, but is now finished. But when Obama says, “the folks here were holding signs,” now the implied action is unfinished, ongoing, and open-ended. And here is where emotions are helpful – to help the listener to resolve the unfinished action (helping you to imagine the folks passionately chanting and shouting, perhaps). 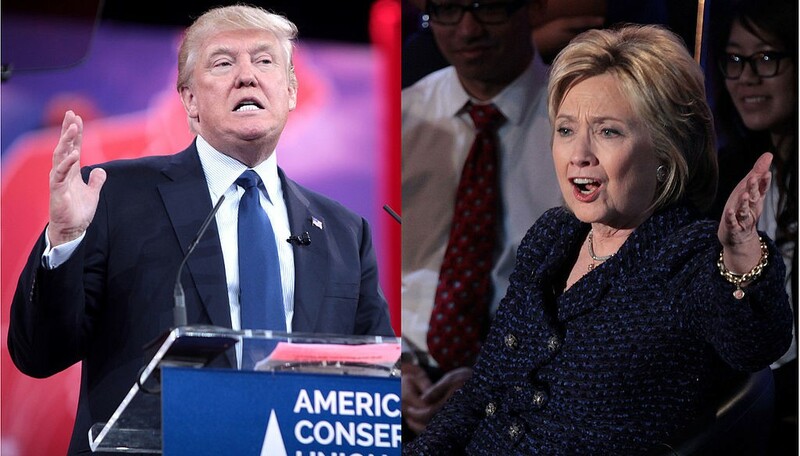 Campaign speeches are likely to differ from other presidential speeches in many ways, so a crucial question is whether the “–ing” grammatical trick really works to elicit audience emotions. In a follow-up study, the authors asked participants to rate the emotional intensity of 100 phrases taken from the presidential speeches – 50 that had the “–ing” ending and 50 had matching phrases written in the plain past-tense. Participants rated the versions with the “-ing” ending (for example, “The middleclass was getting hammered”) as feeling significantly more emotional than the versions written in the plain past tense (“The middle class got hammered”). 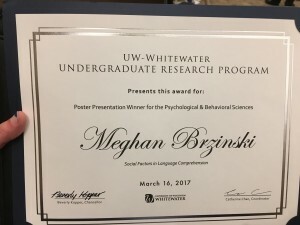 The study was conducted with the help of UW-Whitewater undergraduate students, and is part of our research program aimed at understanding how language and emotion interact. 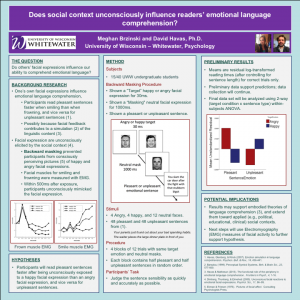 In addition to having implications for the study of language processing and emotion, the findings may contribute a novel approach to understanding political communication. 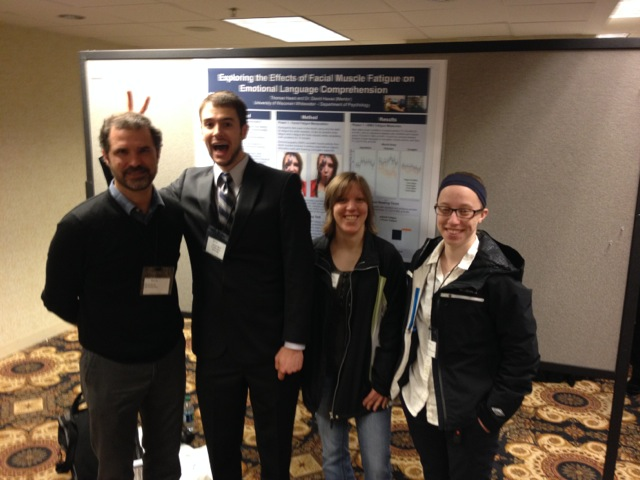 Lab members attended the 2014 Midwestern Psychological Association conference in Chicago to support lab member, Thomas Haasl, who presented his poster titled “Exploring the Effects of Facial Muscle Fatigue on Emotional Language Comprehension” at the conference.